Before coming to India, we were told we wouldn’t even last a fraction of the 4 months that we had planned to stay. “Rubbish”, was my usual response. I knew I’d love India. I imagined loving the food, the colors, the festivals, the people, the fast growth, the low cost of living, everything. How could anyone not love those things? Well, a little bit of reality is starting to set in. It’s not the poverty or the culture shock or even the incessant staring that’s wearing us down. It’s that there’s no market for medium-term accommodation. Yes, it’s that simple, but it’s a very big problem for digital nomads. 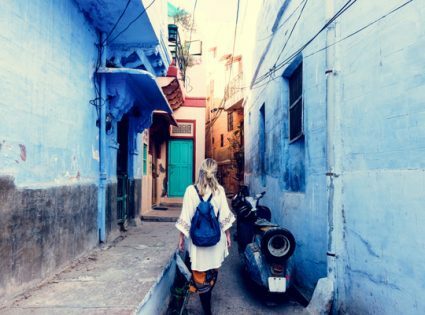 Please, let me explain why India can be found difficult for digital nomads. Were we just lucky in the past? Almost 10 months ago, we arrived fresh in Montreal (Canada) and found a gorgeous apartment within 2-3 days of light searching on the web. It came with WiFi, a kitchen, and furnishings, all in the trendy area of La Plateau for a bargain basement price of $800/month. Woohoo! Then in Peru, with a little more effort, and help from a friend, we found a nice apartment in the heart of Cusco, complete with WiFi, for $450/month. It was a few steps down from our Montreal apartment (the WiFi dropped out sporadically and the kitchen barely worked), but it was manageable (and cheap). Next stop, Argentina. There were many options for medium-term stays, but the prices were much higher than in Peru. Since we only planned to stay a month, we splurged on a luxurious little studio apartment for $1000+/month. Although the language barrier was tough, everything we needed was close-by and the WiFi was well-oiled and very fast. Lauren and I hopped off the Great Circular Indian Railway Challenge at Madgoan station in the tiny Indian state of Goa. It’s the most famous Indian state for tourists, due to it’s white-sand beaches, laid-back lifestyle, and great weather. “Perfect”, we thought. We can rent a bungalow on the beach and kill lots of birds with a single stone. Lauren can train on the beach for her Gobi 2011 expedition, I can work on our new Globetrooper projects, and we can both clear our minds with a few swims in the luke-warm sea, each and every day. It sure sounded like digital-nomad Elysium to me. If only life were so perfect. Put simply, Internet access for visitors to Goa sux. There’s an 8-month backlog on wired connections, and the GSM providers, who keep promising 3G every other week, can barely maintain their current slow offerings. With regular drop-outs and connection speeds of less than 100Kbps, work over the web is painful. We saw no other choice than to move cities. In fact, we were so worried about the state of Internet access in India that Bangalore, India’s IT capital, seemed the only sensible place to go. “Glad we cut our losses in Goa”, I said to Lauren. But little did I know, even more frustration was to come. That’s your typical add for an apartment in Bangalore. No furnishings, no WiFi, and the big one, 10 months deposit! This price equals about $600, which isn’t too bad, but the quality is about the same as our $450 apartment in Peru. However, in Peru, we could rent the apartment on a month-to-month basis, it was fully furnished, and the WiFi was unlimited and free. At a minimum of 10 months, well, we’re screwed. Surely there’s another option? Yes, serviced apartments. It felt like I had struck gold: complimentary breakfast, daily newspaper, free WiFi, gym, etc. Oh, and they’re targeted to long-term visitors. “Great!” I emailed about 20 of them at once to ask for their monthly rates. At this stage, we’d spent 5 days (in Goa and now Bangalore) looking for an apartment. I was ready to accept any price, even all the way up to $1000/month. The work was urgently piling up and we had lots to get done. One of the serviced apartment agents dropped around to drive us around the city to see a few of our options. I was still cringing at the idea of spending the most we ever have in one of the cheapest and poorest countries on Earth. But surprise, surprise, the apartments were awful and the WiFi was as slow as our GSM connection in Goa. “Ahhhh! India, you’re really pushing my buttons now”, said Lauren on her Facebook profile in protest. So, has India broken us? Today we let off some steam off by circling the city and watching a movie at the cinema. I have to say, India has some of the best cinemas anywhere (but that’s another story for another day). While circling the city, we found a month-to-month shared apartment room for 25,000 a month, which still seems very expensive and not ideal for the digital nomad lifestyle (because it’s shared), but it’s our best option at this stage. Lauren has also called on friends around the world to put us in contact with locals, so that may pan out. But otherwise, I can’t help but conclude that India is not a great place for digital nomads. Quite simply, there aren’t enough good medium-term accommodation options, Internet access is hit and miss, and when the planets actually do align, the prices are very expensive and the quality is quite low. India hasn’t quite broken us, but we’re not counting our chickens either. We have found some renewed vigor, but without a real option for medium-term accommodation, our eventual fate may be another plane to somewhere more digital nomad friendly. Thailand perhaps?